The TM Voima consortium is involved in building, repairing and maintaining electricity grid and energy infrastructure. The need for modernization is great, because a large part of the network and distribution technology is several decades old. At the same time, the capacity for utilizing renewable energy is being built, and we are leading experts in this area as well. We cooperate in modernization with numerous development-oriented energy and network companies. Our mutual goal is to improve our customers’ return on their investments in energy infrastructure, as well as to secure the reliability of energy infrastructure. The TM Voima consortium provides services for TSOs, wide area network and distribution network companies, and service companies, as well as other operators in the energy field. Our infrastructure services cover project management, consulting and planning, as well as construction and maintenance. Our services in renewable energy are project management, consulting and planning, licensing, construction and commissioning. Quality certificates (ISO 9001, ISO 14001 and OHSAS 18001) have been held by all companies in the TM Voima consortium since June 2015. Safety is an essential part of high-quality activities. The TM Voima consortium adheres to occupational safety regulations and instructions in all of our activities. In modernizing and building energy infrastructures and networks, the TM Voima consortium is quickly rising to be among the top names. We want to promote development in the energy field in every way, because the energy field – as well as the services and innovations connected to the energy field – offer many growth possibilities, especially in Finland. The growth is based on high-quality education in the energy field, as well as the developing energy market and know-how in energy efficiency. The diversifying energy market is reducing Finland’s dependency on imported energy. Decentralized energy production also provides livelihood and work opportunities in thinly populated areas. TM Voima operates in consulting, construction and maintenance, providing benefits for every stakeholder. TMV Service Oyprovides project management and construction services to power plant and grid owners. TMV Line Oy provides power line design, construction and maintenance services to grid owners. TMV Power OÜ provides services for constructing and renovating distribution network and 110–400 kV substations. 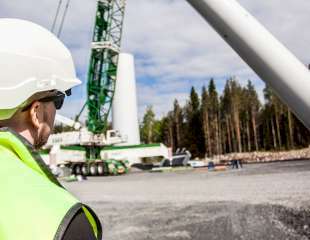 TM Voima Oy focuses on licensing wind power projects. At the moment, we have development projects in the Alavieska, Haapavesi, Nivala, Sievi and Ylivieska regions of Finland.